Cape Town — In light of festive season power cuts, Eskom's woes continue to mount. The embattled power utility plans to ask the government to absorb about R100 billion - nearly U.S.$7.2 Billion - of its debt in order to rescue it from bankruptcy, according to a Business Day report. This would have a negative impact on credit rating agencies like Moody's and Standard & Poor's as a bailout of that scale would add 2% to the government's debt-to-GDP ratio. According to The Citizen, Eskom currently has a debt guarantee to the value of R350 billion - about U.S.$25 billion. This has been flagged as the biggest risk to the fiscus and ensures the state-owned entity remains operational despite heavy strain on the Treasury. While the government has not received any formal proposal from Eskom yet, Chairman Jabu Mabuza mentioned the need for the bailout in an interview during an investor roadshow, Fin24 reports. 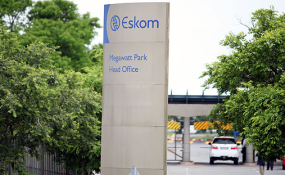 National Treasury spokesman Jabulani Sikhakhane said that any proposition for debt relief will have to be assessed in the context of Eskom's planned turnaround strategy for 2019, which the power utility is expected to present soon. Hopes of a bailout getting the green light from Tito Mboweni may end up dashed after the Finance Minister said in an interview during the G20 Summit that Eskom "must go to the market and raise money", Tech Central reports. Mboweni added: "We are going to reconfigure state-owned enterprises and I further said there will be no holy cows in the process ... It's very clear that it cannot be business as usual and we have to take bold steps to move the country forward. The fiscus is not in a position to continue pouring money into assets which are not productive. This is like pouring water into a sieve and hoping that its going to fill up."